Solar Screens services in the Austin TX area. Our Solar Screen pricing is aggressively inexpensive. Solar Window Screen pricing is. to be the best in the Austin TX area ! We hand assemble our Solar Screens specific to the unique sizes of each of your windows. Phifer Suntex 80% and 90% solar window screen fabrics. 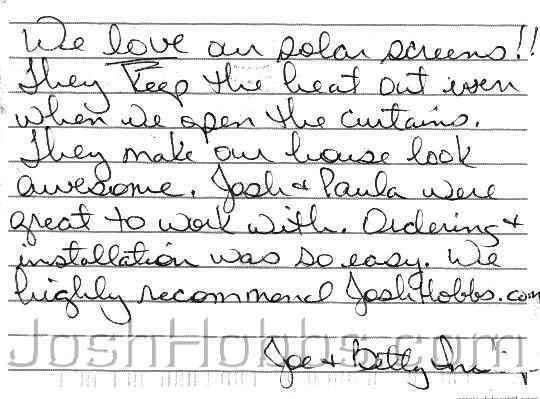 "Providing you Relief from the Hot Texas Heat"
A solar window screen (a.k.a. 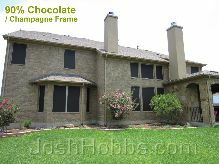 sun shade screen, solar shade, sun screen and window shade screens) made by wwwJoshHobbs.com can fit over any size or shape of a window that belongs to a home including mobile homes or windows of commercial businesses. We custom build our solar screens unique to the size and shape of your window, and we will only custom build one kind of a solar window screen and that is the highest end solar window screen that we can. It doesn’t make sense to spend the money and to make an investment like this for an inferior product, so we don’t fool around with any materials that we feel to be inferior. We only use the Phifer Suntex 80% and 90% shading fabrics, and for enhanced stability we use 1” heavy duty framing with miter cut corners held together by aluminum corner inserts, not plastic. We do not use any type of plastic. Plastic in this Texas heat will only become brittle and thus break. -Here in Austin we see all the time were other installers will cheapen out to use inferior components like plastic corners and invariably they all at some point become worthless an brittle.- For both the 80% and 90% Suntex solar screen fabrics we offer five colors to choose from. On our website you can see these colors and you can order a free sample kit which includes fabric swatch samples of all five colors. -We only mail this sample kit to addresses within our Austin TX service area.- We additional offer five frame colors to choose from, which are also listed on our website www.JoshHobbs.com and included within the free sample kit. We do not offer a pickup self install service for our solar window screens, we only build and install screens for the windows we have measured (we do not ship our solar screens, build solar screens for pickup orders or build solar screens for self installers). From our website you can quickly and easily create your own estimate to see what the installed solar screen cost would be for the windows of your Austin TX house or commercial business building. Additionally, we have multiple pages of hi-res Solar Window Screen Pictures, showing what our solar screens look like on the different types of homes. If you are wanting to educate yourself about solar windows screens, we have a great Questions and Answers page that for sure will have your question and an appropriate answer on it. Our Q&A page is very thorough. 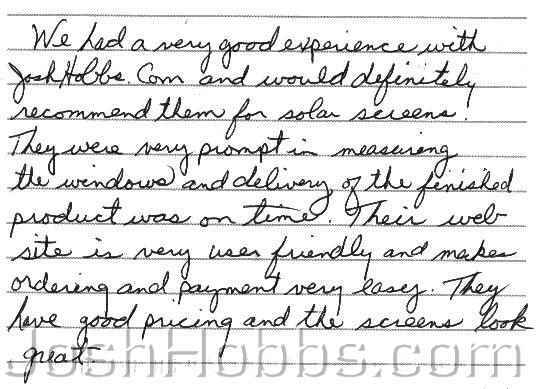 To learn about JoshHobbs.com and to read 100s of feedback and reviews from our customer, we have multiple Solar Screen Customer Feedback pages for you to take a look at. And, if you would like to learn about how we install our solar window screens on the many various types of windows, we have a page titled Videos of How We Install. 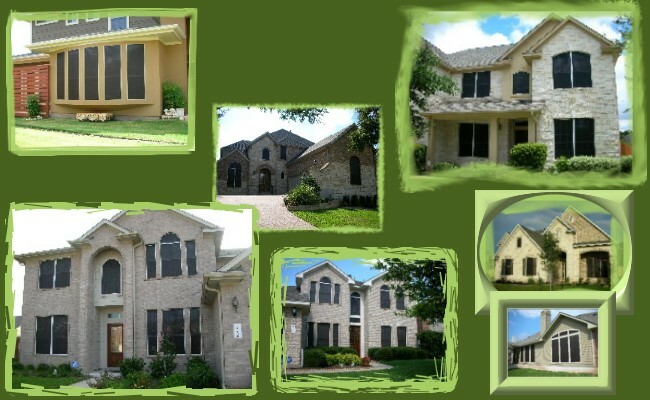 Solar Screen Installations around the Austin TX area. usage and cooler room temperatures. 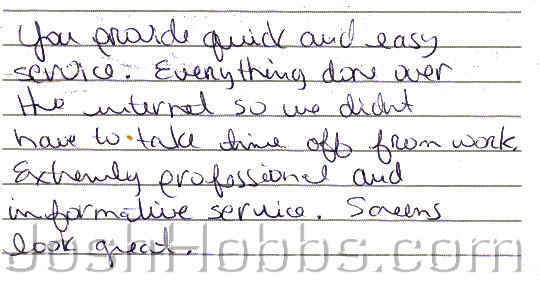 My experience was fantastic - so easy, quick and efficient ! The online information is fantastic with the comprehensive videos and information. The whole processes is slick. I'm truly amazed. The finished process is perfect, and you two are true professionals. I can't thank you enough. 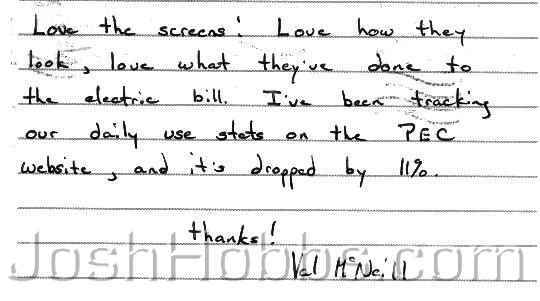 On a scale of 1 - 10, your Solar Screens Austin TX Service is a 10 ! I'll recommend you to everyone, with highest enthusiasm. I love these screens. I really appreciate the friendly way both of you treat your customers. An A+ Solar Screens Austin Supplier. Love the Solar Window Screens (Sun Shades)! Love how they look. Love what they've done for my electric bill. I've been tracking our daily use stats on the PEC website, and its dropped by 11%. Thank you so much for the great Solar Screens Austin Sun Screens! Ya'll were absolutely a delight to work with ! 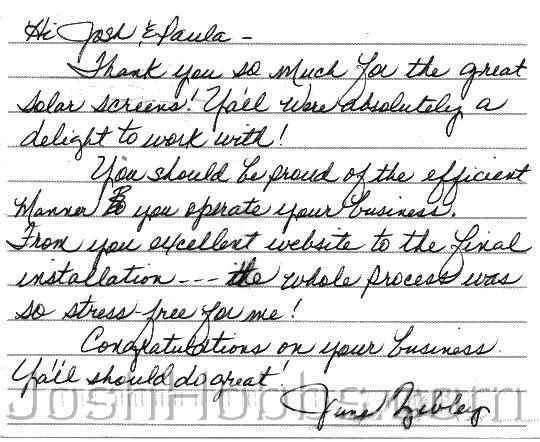 You should be proud of the efficient manner you operate your business. From the excellent website to the final installation - - - the whole process was so stress free for me ! We are so happy with our new solar screen heat shade screens. Our rooms are noticeably cooler. 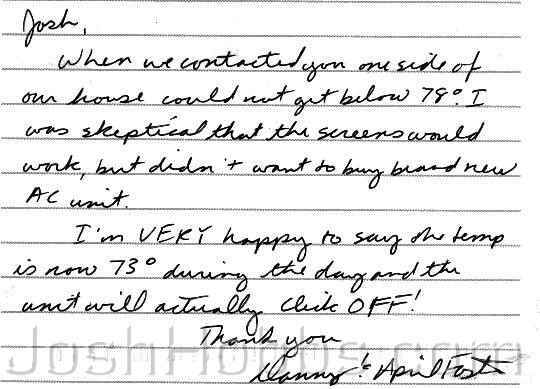 re: 69 Georgetown, TX - Solar Screens (Solar Blinds) work, I am very happy to say the temperature in my house is now 73degrees. re: 73 Austin, TX - What a huge difference the Austin Solar Screens (sun shades) have made in the temperature of my sun exposed rooms. 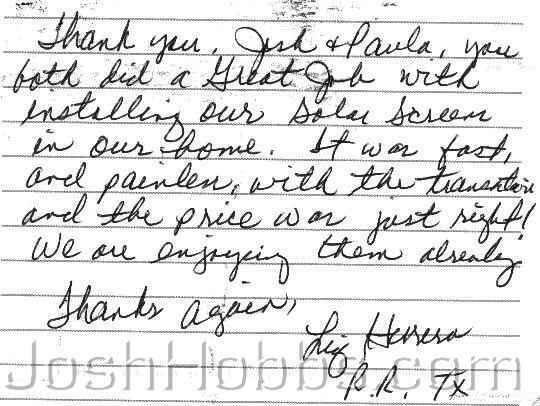 re: 76 Hutto, TX - We love our solar window screens (sun screens)! They keep the heat out even when we open the curtains. re: 77 Austin, TX - We love the look of our new Solar Screen Austin Texas (shade screens) and our rooms are significantly cooler. 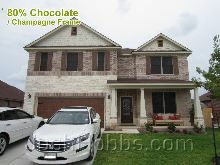 re: 78 Leander, TX - We love the solar window screens (heat shade screens). 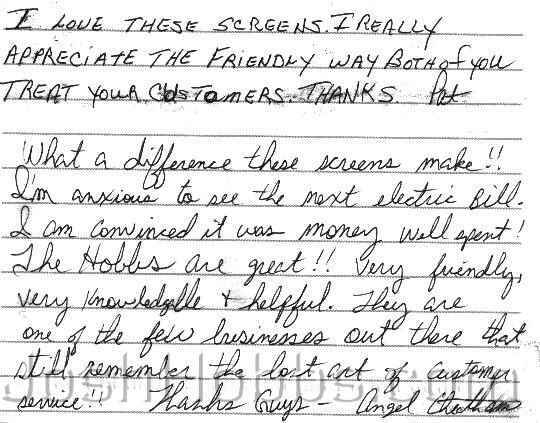 It's a pleasure doing business with you all, you are an 5 star Solar Screen Austin Texas business. 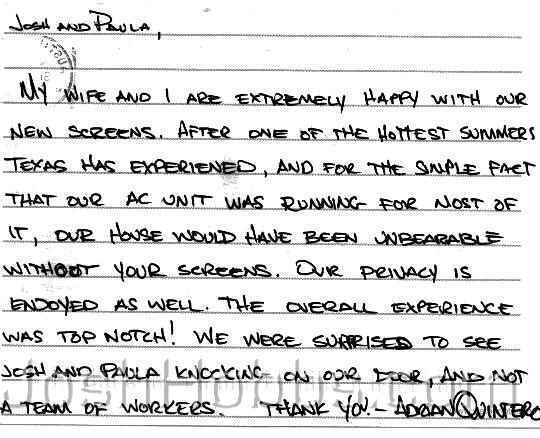 re: 101 Round Rock, TX - On a scale of 1 - 10, your Solar Screens Austin TX Service is a 10! I'll recommend you to everyone, with highest enthusiasm. re: 102 Pflugerville, TX - I really appreciate the friendly way both of you treat your customers. 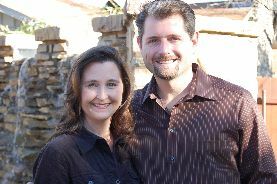 An A+ Solar Screens Austin Supplier. What a difference these Glass Shade Screens make! re: 103 Austin, TX - Our house would have been unbearable without your Solar Screen Shades. re: 104 Round Rock, TX - You both did a great job with installing our Window Shades. The transaction and price was just right ! I recommend you as a solar screens Austin TX supplier. 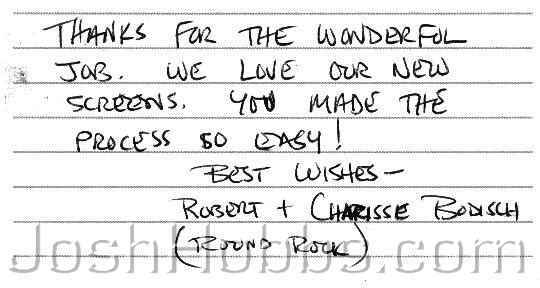 re: 105 Round Rock, TX - Thanks for the wonderful job. We love our new Solar Window Screen (Sun Control Shades). 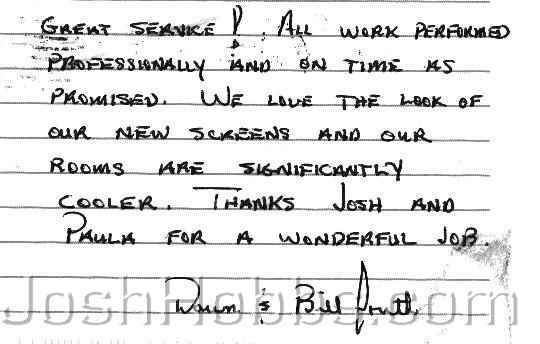 re: 100 Lakeway, TX - We had a very good experience with JoshHobbs.com for Austin Solar Screens and would definitely recommend them for Solar Blinds. re: 99 Cedar Park, TX - Love the Sun Shades! Love how they look. Love what they've done for my electric bill. Solar Window Screens are the answer. 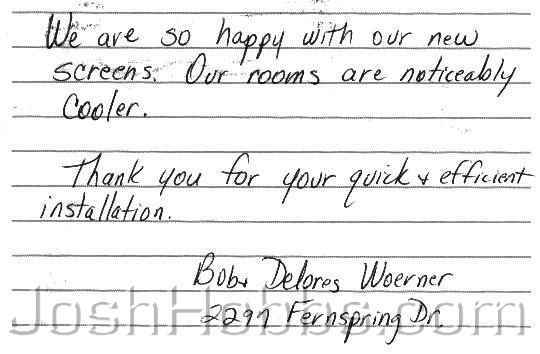 re: 98 Pflugerville, TX - Thank you so much for the great Solar Screens Austin Sun Screens! Ya'll were absolutely a delight to work with ! 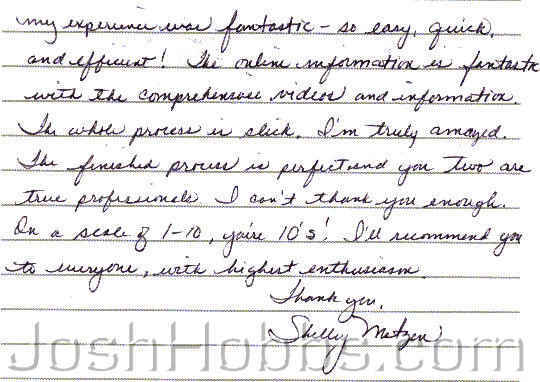 re: 96 Austin, TX - You provided quick, easy, extremely professional and informative Solar Screen Austin TX service. The Window Sun Shade Screens look great. 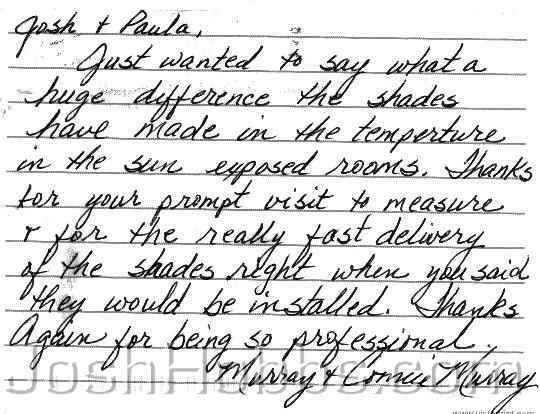 re: 95 Round Rock, TX - We are so happy with our new solar screen heat shade screens. Our rooms are noticeably cooler. Austin Solar Screens are extremely important when you are wanting to keep the heat generated by the sun out of your home. Solar Screens Austin Texas are a significant component when trying to reduce your energy costs. By shading your home’s windows your home will stay MUCH COOLER, therefore your A/C will not need to run as much. Solar window screens limit (by shading and reflecting) the sun's heat and light from entering your house (home) / business (commercial) windows. Once your windows (single paned or double Paned) have been protected and shaded by that of a solar screen, you will see a significant difference in temperature inside the house / commercial building around those windows. Right now, if you have a lot of heat around a window, touch that window where the source of heat is coming from and you will see how warm to the touch that window is. When you protect that window with a solar window screen, you’ll see that window drastically cool off, therefore the area around that window too will significantly reduce in temperature. Once we provide our Solar Screens Austin TX Services, by shading your home's windows with solar screens, we recommend that you the customer test the windows by touching them to see how cool to the touch they have become. The area around a window that's been shaded by that of a solar window screen is CONSIDERABLY cooler than that of a window that is not shaded by a solar window screen. The premise of solar window screens is simple, solar window screens provide shade for windows by mounting on the outside of the window (see our solar screen installation video here), between the window and the sun, thus when your windows become shaded, your windows do not get the direct sun, therefore the glass of those windows do not get hot. If the glass of a window does not get hot, there is NO heat from hot heated glass to transfer into the home. If you are looking for a Solar Screens Austin supplier to source solar windows screens for your Austin Texas house (home) or business (commercial property), we are your source. Austin Solar Screens will play a significant role in reducing the temperature inside your home to help reduce your energy consumption. 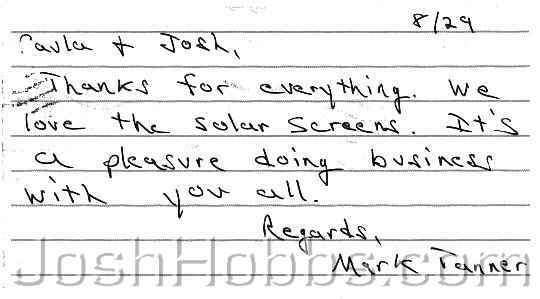 We strongly recommend that you take a look at our Solar Screens Austin TX www.joshhobbs.com website to help you make an educated solar window screen purchase. Our Austin Solar Screens website is extremely thorough with tons of valuable information to help guide you to make the right decision.